Tokyo Otaku Mode™ Launches Smartphone App Tokyo Otaku Mode mini! Tokyo Otaku Mode mini Keeps Otaku Culture Fans Updated with the Latest Japanese Otaku Entertainment News Anytime and Anywhere from Their Smartphones! TOKYO – Tokyo Otaku Mode™ (TOM) announced the launch of its smartphone app Tokyo Otaku Mode mini on June 20, 2013. Tokyo Otaku Mode mini brings the latest Japanese anime, manga, game, and otaku entertainment news daily in English to its users’ smartphones. The app is available to download free of charge via iTunes Store® and Google Play™. TOM provides the latest entertainment news on anime, manga, games, and pop music, as well as showcases otaku art works, such as, cosplay, kyaraben (character-themed food art), and latte art to the world on its Facebook page, which has over 12.5 million* likes, and on its website, Tokyo Otaku Mode β (http://otakumode.com). Tokyo Otaku Mode mini not only offers full access to otaku entertainment news articles that are delivered daily on Tokyo Otaku Mode β, but also sends scheduled notifications to app users when new articles become available. Also, once articles are uploaded to the app, users can enjoy browsing them even without an Internet connection. The articles are divided into 13 different categories, making it easy for users to browse news they are interested in as well as access archives of previous articles. Users can also share their favorite articles with their friends through Facebook and Twitter. 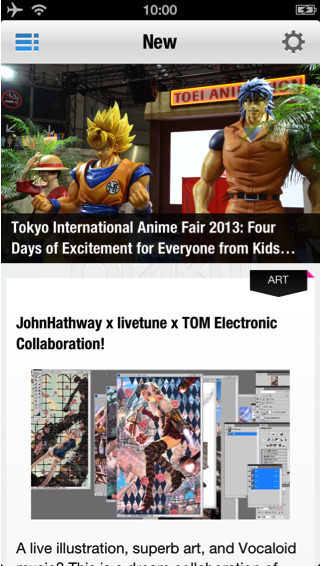 Allows users to access the latest otaku entertainment news. Sends scheduled notifications when new articles become available. Uploaded articles can be enjoyed offline. TOM is a worldwide distributor of otaku content, including anime, manga, cosplay, and otaku entertainment news. Owned and managed by Tokyo Otaku Mode Inc., which was incorporated in Delaware, U.S. in April 2012 by President and CEO Tomo Kamei, TOM has operated its Facebook page (https://www.facebook.com/tokyootakumode) since March 2011. In just two years since its launch, TOM has accumulated over 12.5 million* likes on Facebook, becoming the largest Facebook page operated by a Japanese company. Currently, 99% of its fanbase reside outside of Japan, with fans particularly increasing in Asia. TOM also launched its own website, Tokyo Otaku Mode β (http://otakumode.com), in 2012. The website offers otaku entertainment news articles in English and a user-generated content (UGC) platform on which TOM subscribers can upload their own self-created otaku artwork, cosplay photos, and more. * As of Jun 10, 2013. All company names, logos, and products are trademarks of their respective organizations.